What you are about to read is not an unusual occurrence! For the first time in your life, you may be faced with having to make a decision about how you should go about buying an incontinence product. It will be a shopping experience unlike any other. You have no problem when shopping for clothing, food, a TV, or for that matter, most any item that you commonly use. But, when it comes to purchasing an incontinence product for the first time, you’ll find yourself clueless. The big difference is, you don’t know anything about what you are going to buy and even more troubling is you’re hesitant to even talk to anyone about what you’re looking to buy. So, where do you start under these circumstances, and how do you educate yourself on the subject of incontinence products? The bottom line is this…if you become faced with the onset of incontinence, you have to find a way to become educated on the subject of buying incontinence products. Let me attempt to give you the tools you’ll need to become educated and knowledgeable about this subject. The following information applies to both men and women. Do I need an incontinence product? The very first question to ask yourself is whether or not you are a candidate for an incontinence product. A very good rule of thumb is…if you cannot reach a bathroom in time to satisfy your urge, the result will be leakage and wetness of your underwear. You must then ask yourself whether this is a onetime accident or a frequent episode. If it’s a frequent episode, you most likely have an incontinence issue. And, this is when you should begin to get educated on how to buy incontinence products. Below, I will outline things you need to know about incontinence products. When learning about incontinence products, one of the very first things you become aware of is that there is a variety of prices, from low to medium to high. Therefore, your first thoughts may be let me try the least expensive product first and if it doesn’t do the job, I will buy a more expensive product…WRONG! Your first approach is not price, but instead, what is the best product for my particular symptoms? In order to make this decision, you must understand your own incontinence symptoms. Let’s talk about various symptoms and how these symptoms relate to product selection. Your initial evaluation should be to determine your personal level of incontinence. If you are dealing with a very low level of incontinence, for example, having few incidents of leaking and small amounts of wetness during the day, you most likely need an incontinence product that has light absorbency, such as a liner or a pad. However, if you have heavy leakage, you will need a product that has high absorbency, such as, protective underwear or a fitted brief. Once you have made an honest evaluation of your incontinence symptoms, your shopping spree for the correct incontinence product becomes a bit easier. Look on the label for information about the amount of liquid the product is capable of absorbing…you will usually find a guide showing the product’s level of absorption. It’s usually depicted by an illustration showing liquid drops…the more drops shown, the better the absorption. For first time buyers, I strongly recommend trying the product before you buy the product. This is good advice, especially for first time buyers. By testing a product, you will be able to determine if it’s the correct choice for your level of incontinence. 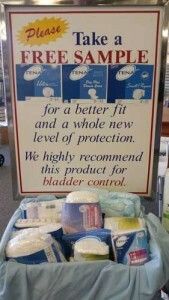 Careway Wellness Center offers an excellent free sample program for its Tena products. Simply call us 800-292-4343 and speak with one of our incontinence specialists. Once you receive the product, try it in the privacy of your own home before deciding to make a purchase. This way you can identify if it’s the right product for your level of incontinence. Other options to request a free sample of Tena products are to email us, or if you live in the vicinity of our retail store, just drop in and select it from our free sample basket. If the product you decide on is a Tena product, we certainly want to be sure you buy it at the very best price. You will be able to do this by joining our extremely popular Tena Club. The Tena Club is Careway Wellness Center’s own creation and we have a passion for its concept because it’s so easy to join and it helps our customers save money. In addition to our regular discounted prices, you’ll get an additional 10% OFF your Tena purchases if you are a member of the Tena Club. This can add up to be a substantial annual savings. The Tena Club is a unique program with members throughout the entire United States. Membership is absolutely FREE and registering to become a member of the Tena Club is quick and easy. Below, you will find a video that walks you through the process on how you can become a member of the Tena Club. You can also call us directly at 1-800-292-4343 and ask one of our incontinence specialist to sign you up for the Tena Club. It’s so easy to do!